Ground meat is so versatile. This is my whimsical lettuce wrap. 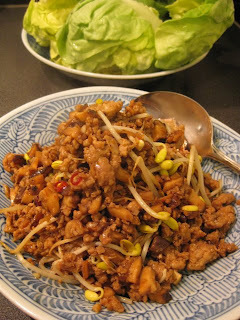 In a wok, heat the sesame oil and saute ground pork at medium heat. When the pork is almost cooked through, add the shiitake mushrooms and continue sauteing for another couple of minutes. Make a small empty spot in the wok and add tobanjiang and heat it until fragrant, then stir with the pork mixture. Add the sauce mixture and stir. Turn the heat to high. When the sauce is well blended with the other ingredients, add the soy bean sprouts and stir for another minute. Enjoy with the lettuce and the chopped herbs.